Note: This page applies ONLY to users of Windows 7 and Windows Vista using Insider TA v4.0 through v6.0. 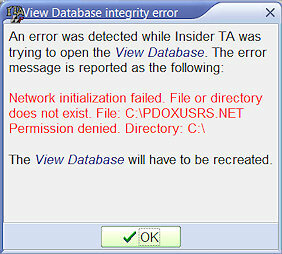 This page does NOT apply to you if you are using Insider TA version 6.1 or greater. 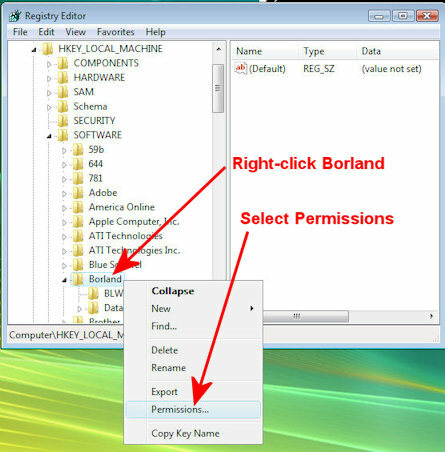 A permission for the BDE must be given in the windows registry database. A BDE attribute named "Net Dir" must be configured to an arbitrary folder other than the root drive (C:\). This configuration is done in the "BDE Administrator" program that's installed with Insider TA. (This step is automatically performed by Insider TA v6.0). Right-Click on the entry labeled "Borland". 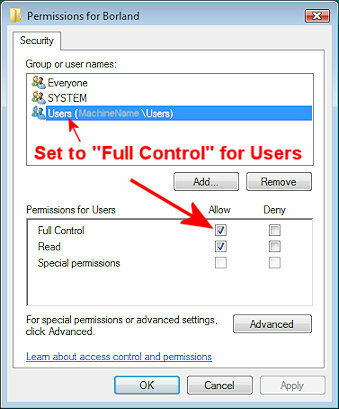 Under "Permissions for Users ", select "Allow" for Full Control. 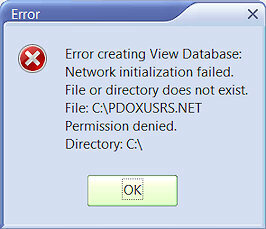 Then click OK.
Click OK to exit the Registry Key Permissions dialog box. NOTE: This step is automatically performed by Insider TA version 6.0. You only need to perform the following steps if you're using Insider TA version 5.4 or earlier. So let's stick with this example. Create a subfolder off the root drive C and name it "BDEShare". So the file path for this new subfolder will be "C:\BDEShare". Remember this string value because you will need to enter it below. Now the BDE must be configured to use the new folder. This is done in the Windows control panel, where you will find an applet named "BDE administrator". Note that you will only see this after the BDE has been installed to your system (which is done automatically during the Insider TA installation). As shown in the above picture, click the tabsheet titled "Configuration". 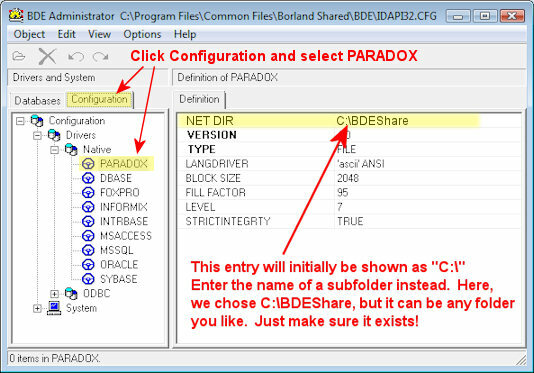 Expand the configuration as shown (Drivers - Native) to expose the entry titled "PARADOX". Single click the item named PARADOX. Now observe the data that fills on the right half of the dialog. You will need to edit the entry for "NET DIR". Initially, it will be shown as "C:\". You need to change that entry to the subfolder that you created above. In our example, this is C:\BDEShare. If the BDE Administrator is not capable of making the change then verify that the permission in the registry has been set properly. If this isn�t the case then retry to apply the permission as described in the above. Now start Insider TA. With the BDE now configured to work with Windows 7 or Vista, Insider TA will function properly. Stock Blocks is a registered trademark of Stock Blocks, Inc.